A boot suitable for touring with high-technical details. Upper microfiber with Cordura® inserts, inside waterproof and breathable Gore-Tex® membrane. Front and rear elastic insert on the instep area, reflex yellow fluorescent details for better visibility in lowlight conditions. 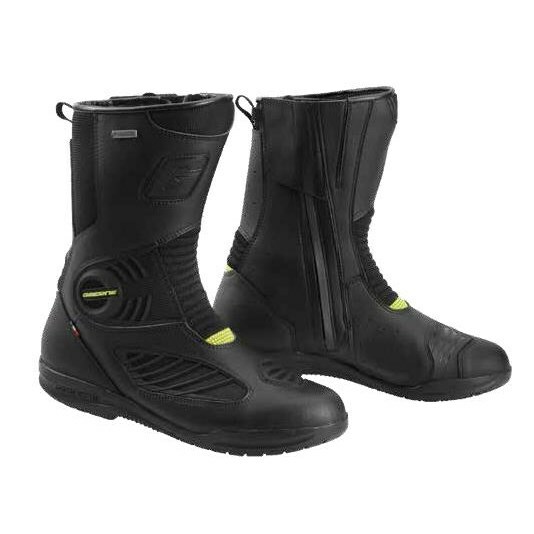 Thermoplastic protections on the ankle and shin, gear protection. Double closure system with zip and Velcro® strap, anatomic and removable innersole, rubber sole with a specific design for a good grip on the bike and on different surfaces.